Go West on 408 to the Florida Turnpike North. Turn left on SR 19 North. Stay on Hwy 19 North to the town of Howey-in-the-Hills. Go through the flashing light. Turn right at the first STOP light, following SR 19 across the bridge. Hickory Point will be on your left after the bridge, enter at main entrance. NOTE: There is a $2.00 per car parking fee to get into the park. The machine accepts bills or quarters. The fee is required by the Lake County Water Authority. Approx. drive time from Downtown Orlando: 45 minutes. 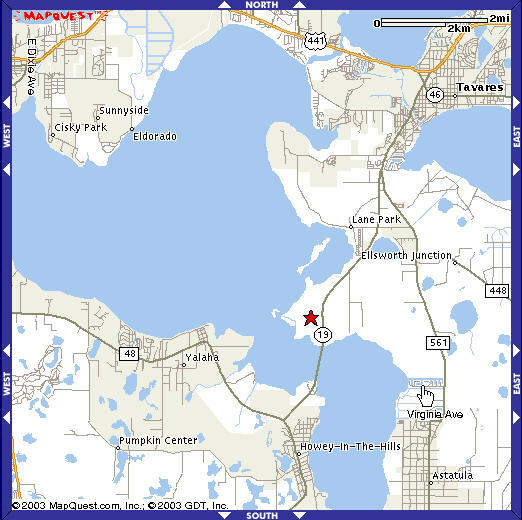 Take Us Hwy 441 North to Tavares. Turn left onto SR 19 South and go to Howey-in-the-Hills. Hickory Point will be on your right. (If you cross the bridge, you've gone too far).